MOCNESS is a set of nets for catching zooplankton. It stands for Multiple Opening/Closing Net and Environmental Sensing System. The MOCNESS on this cruise has nine long, tapered nets on a sturdy rectangular frame. 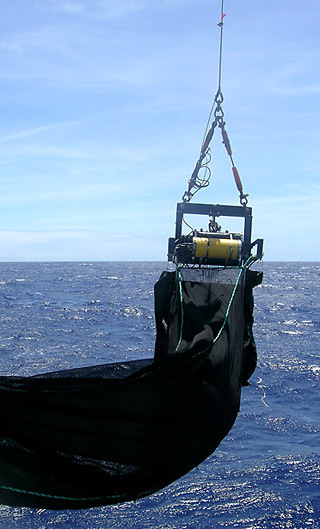 Each net can be opened and closed independently to sample zooplankton from different places—in this case, from different depths. As the MOCNESS frame is towed behind a research ship, a researcher decides when to open and close the net by tracking water conditions in real time with the environmental sensing system. With this array of sensors, researchers can choose to sample at a particular salinity or depth, for example. Those measurements are also recorded, so the researchers can match the zooplankton they caught in their nets to the physical properties of the seawater the zooplankton were swimming in at the time.